Not counting the time he descended, he did 5.42 W/kg for the last 2 hours of the stage. *edited the W/kg so it is based on a weight of 67.15kg instead of 69.5kg. Last edited by Netserk on 29 May 2018 20:33, edited 1 time in total. 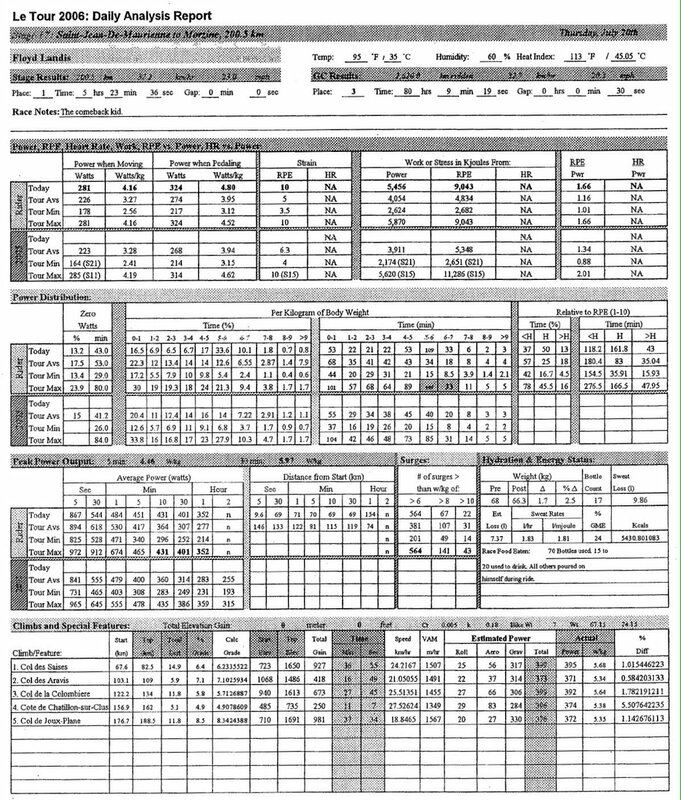 The correct weight should be the 67.15kg that is listed in the calculations, even if it wasn't the one used. edit: This was a response to a post by Merckx index. Netserk wrote: Not counting the time he descended, he did 5.24 W/kg for the last 2 hours of the stage. As I noted upthread, Froome averaged 5.40 W/kg for the Finestre and final climb. If you begin when he attacked it would be a little higher, because he upped his power from earlier on the Finestre. In the Froome thread it was reported his initial attack was 390 watts, which would be about 5.7 W/kg assuming 68 kg. In any case, it seems likely Froome's average power over the solo period, not including descents, was greater than Floyd's. Out-Landish indeed. The nature of it is that everything he did today is within the realms of physiological capacity. It was the style with which he did it, the panache and the bravado and the courage [which stood out]. I deleted my original reply, because I was confused, thought the 5.24 W/kg referred to Froome. In the article linked by Roundabout, Floyd's power excluding descents was reported to be 364 watts, which would be 5.35 W/kg assuming 68 kg, which is what wiki lists his racing weight at. In any case, it seems that Froome and Landis are pretty close in terms of weight/power over the course of their solos. Would certainly be interested to hear Floyd comment on this. Velon reported that Froome's Finestre attack lasted 11 minutes and averaged 397W. At (say) 67.5kg that's 11-min @ ~5.9W/kg. As for the Swart data, there is quiet a difference in physiological responses between 20-min power and 40-min power. 40-min and 60-min power and power at threshold will probably not be all that different as the P-D curve is much much flatter there, but 20-min power may well be quite different as non-sustainable physiological responses to the energy demand are playing a more substantial role. 20-min power is definitely above threshold power. That said, doping/not doping? Low numbers are not indicative of not doping. But lower numbers don't generate click bait "doper" headlines for the usual suspects. It doesn't fit their narrative. Alex Simmons/RST wrote: Velon reported that Froome's Finestre attack lasted 11 minutes and averaged 397W. At (say) 67.5kg that's 11-min @ ~5.9W/kg. Ross Tucker had some interesting rants. In one he provided a pretty compelling argument that doping is much more about correcting the 'state' that training or racing can put you in. In other words, working at a physiologically high/near max level can result in issues that are in many ways like a disease state. So many doping products that bring you closer to "normal" can improve performance and recovery, even though they do not make you "faster" per se. Netserk wrote: Not counting the time he descended, he did 5.42 W/kg for the last 2 hours of the stage. Does this include the false flat sections? There wasn't much false flat in the stage to Morzine. Netserk wrote: There wasn't much false flat in the stage to Morzine. Oops. I was confusing Froome and Landis. Froome climbed Finestre in 1:04:18. Thanks for these data. Both of Froome's times on the climbs correspond to 5.40 W/kg by Ferrari's equation, well below the level considered more or less the limit of clean riding. Of course, most of the Finestre was climbed with the group; he would have been putting out more power after he attacked. And assuming he put out the same power on Sestriere, he was sustaining that level for about two hours of climbing, punctuated by what? 30-40 minutes of descending? Pretty sure they've got the friction wrong on Finistere. But yeah, there's no humid sterrato option on the simulators. I'd add a little to that part of it, I don't know if I'd trust the Velon numbers given the glitches but I'd trust them more than 5.1W/Kg. It takes a little more power than that run that type of winnowing machine at a WorldTour level. Quintana's Croix-de-Fer + Alpe d'Huez attack was a similar length (in time) effort but executed at around 6W/kg and 6.3W/Kg -that's why Dumoulin was waiting for his "old lady", and also why he wasn't going all out for those stretches -he'd be dropped like a twig in a vacuum by any of his rivals if he did. BTW, I don't know why Chronowatts doesn't just use Bernal's actual watts as he posts them on Strava. They're also a bit higher than their estimates. 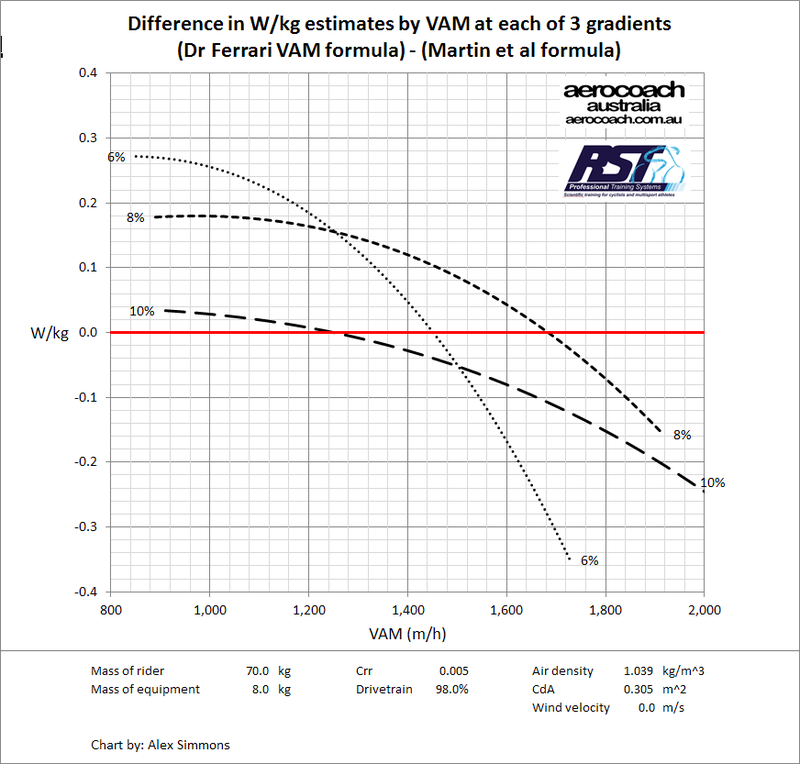 In terms of sensitivity of rolling resistance to W/kg estimates, even a doubling of a typical road Crr assumption would add ~0.2W/kg or an error in W/kg estimation of about 3%. That's on say a 10% climb. Alex Simmons/RST wrote: 5.4 W/kg is the Clinic's new 6.4 W/kg. 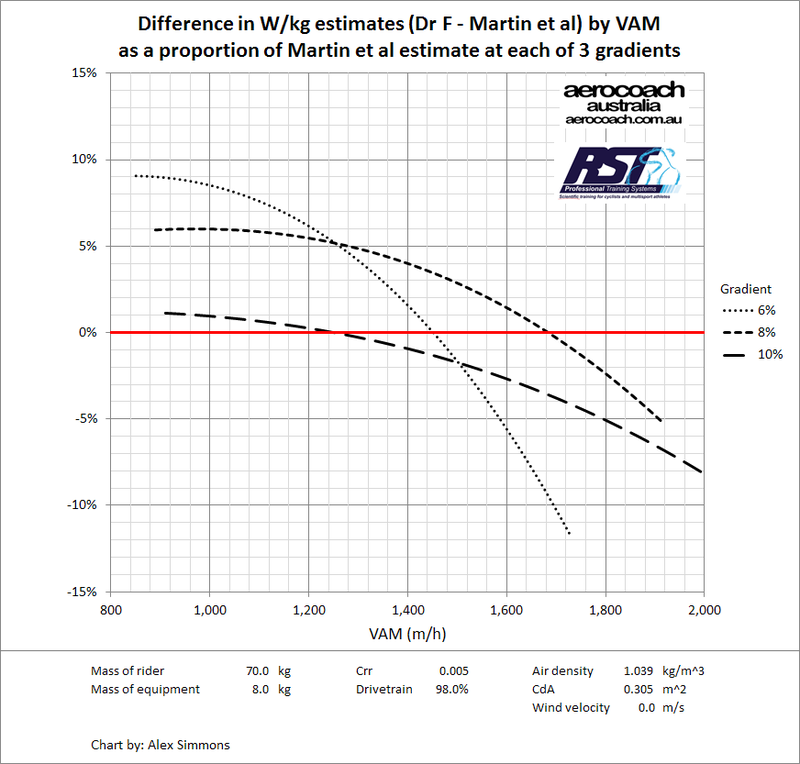 Alex Simmons/RST wrote: In terms of sensitivity of rolling resistance to W/kg estimates, even a doubling of a typical road Crr assumption would add ~0.2W/kg or an error in W/kg estimation of about 3%. That's on say a 10% climb. 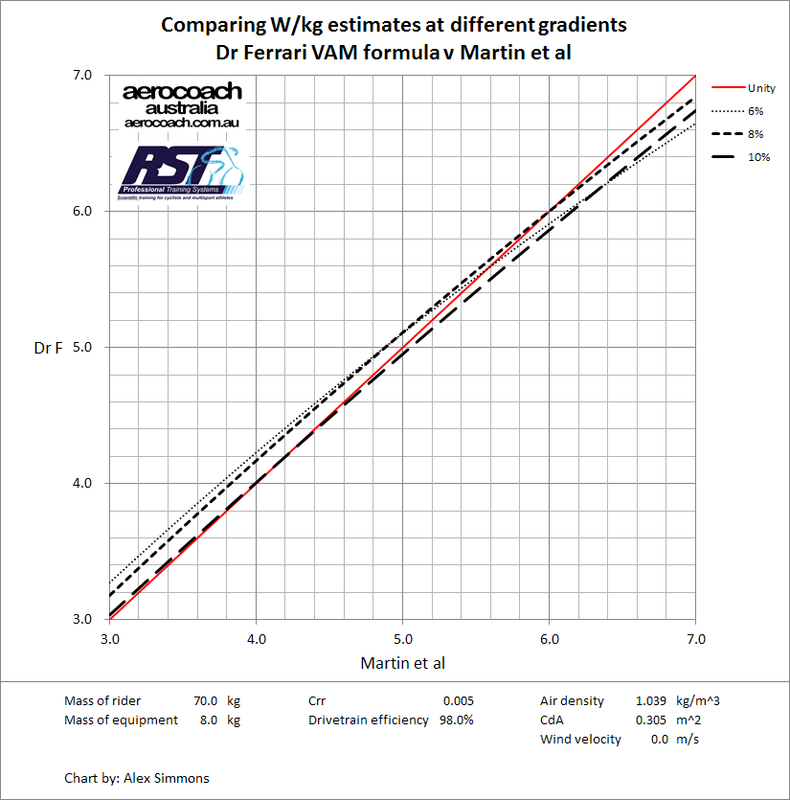 So according to that calculator, and given standard assumptions otherwise, a 67 kg rider (75kg including bike + kit) would have to put out around 5.1W / kg to go 14.9 km/h on a 10% grade assuming ashpalt road Crr (.004), losing 12W due to rolling restistance, vs. 5.3W/kg, losing 24W due to rolling restance, assuming rough tarmac CRR. So that matches up pretty much perfectly with your calculation. However, that assumption, according to the calculator would still just be rough tarmac. A thoroughly uneducated guess, extrapolating from that and given my limited experience cross country mountain biking, would be that humid sterrato could imply a further doubling of Crr. So closer to 48W according to that calculator, implying a power output of 5.66 W / Kg. Sure, that's just a guess. And Finestre is partially paved. But I do still think there might be some friction losses given the surface and the conditions on the day that most estimates are leaving out. The link provides just watts, the W/kg values seem to assume 67 kg, which is probably close to the correct weight. Also, according to the link, Finestre was done at 360 watts, slightly higher than Siestrieres, and corresponding to 5.37 W/kg. Anyway, as I’ve noted before, these values are quite close to Floyd’s in the Morzine stage. Assuming a body weight of 68 kg, his average power over the first 30 minutes was 5.90 W/kg, and his power for the last two hours (not including descents) was 5.35 W/kg. The actually pedaling in the last two hours was apparently about 105 minutes, which is close to the 110 minutes Froome spent climbing Finestre, Sestrieres and Bardo. The link provides just watts, the W/kg values seem to assume 67 kg, which is probably close to the correct weight. Also, according to the link, Finestre was done at 360 watts, slightly higher than Siestrieres, and corresponding to 5.37 W/kg. No. The links provides normalized (etalon) watts, meaning they are multiplying W/kg by 70 kg. Moreover, they are guessing Froome's weight to be 68 kg. See Vayer's tweet, just above the linked tweet. Cool, yes the actual Crr is an unknown, and is of course variable so we are really dealing with entire section or entire climb averages. IOW, rather than post the raw watts, they post (watts X 70/68). I’ve never understood why they do it this way. At least Allan Lim posted Floyd’s raw watts.